It is always a challenge to decipher the authenticity of such photos, although the originator of the posts is a user with the @evleaks handle. @evleaks have a record of leaking new consumer electronics devices, especially ones that are scheduled for an imminent release. This particular image is claimed to be intended for the press. 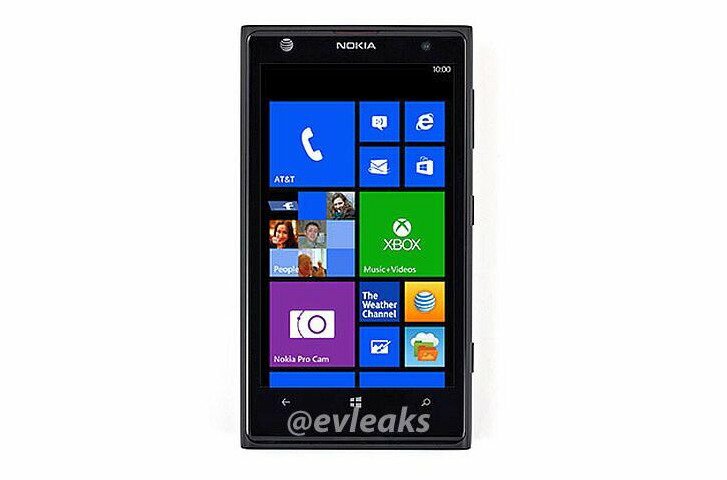 Seemingly, the Lumia 1020 is set for a 2013 release, which is no major surprise. The picture in question shows an ATT&T model (the leading USA carrier’s logo can be seen on the top left hand corner). Besides that, we won’t learn too much about the new Nokia until we see some additional photos, namely ones showing the rear of the phone. That will be required, as until we see the back of the phone we won’t learn much about the visual differentiation between the 1020 and its Nokia peers, namely the other Nokia Windows Phone. As of right now, to be frank, the new Lumia looks almost identical to these peers. We’re expecting Nokia to announce the phone officially on a Nokia press event in New York on July 11th. The company’s aim will be to steal a march on their competitors, a number of whom are also planning to release upgraded camera-led devices. Amongst these releases will be the Samsung Galaxy S4 Zoom, which will focus on its 10x zoom lens. Sony are also planning to release a phone called the Xperia i1, which will feature a 20mp camera. This trend towards enhanced camera phones is going to be a big part of the releases this year. Causing further damage to the compact camera market, where sales are now declining towards a terminal point, it seems that consumers are now pushing for better spec’d cameras. This growth appears to also be powered by the popularity of services like Instagram, where users share pictures and now videos in a photography led social media environment. Next articleAre smart phone sales starting to decline?